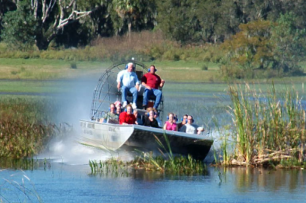 Airboat tours are truly a thrilling experience that all the family will get a kick out off. And best of all, although finding a company in the Florida Keys itself is a little bit scarce, you are literally a stone’s throw from the greatest exponents of strapping a huge fan to the back of a boat and zipping across the top of the water that you'll ever find. Yes, the world famous everglades are very close indeed, and within their confines there are quite a few companies offering eco tours, wildlife displays or simply the thrill of going extremely fast across the surface. All of them will have a huge amount of experience in spotting, the local wildlife such as alligators, crocodiles, eagles, manatees, and even huge burmese pythons! So look closely at the airboat tours listed below as we will name then either FLA KEYS or MAINLAND to give you a clearer indication of where they are based, Florida Keys or Florida mainland. Ok, then let’s go and find you the most fun airboat tours we can, and don’t forget to check out our other pages on eco tours either. If you have an image of a day sitting in a boat as the wind whistles through you hair, and the giant fan at the back of the boat creates the sound of a jumbo jet, then you will be disappointed. Not that you wont get that for 30 t0 40 minutes, but at the Everglades Safari Park, you also get a chance to wander the trails, see the alligator show, and other great everglade wildlife attractions. The safari park have been in operation for 40 years, and deliver what their customers want big time...a great day out. You can choose the speed of the tour you wish to undertake, with either a fast speed, exhilarating trip, or a slower paced eco tour full of educational tips and facts concerning the fauna and animals of the area. And don't think you have to fit in with everyone else either. You can also choose the time of travel, from the dawn chorus, right through to night trips. Totally tailorable to your own requirements. Right in the heart of the Everglades, Captain Greg Brown will take you back through the decades of Florida history, with tales of the Native American Indians that lived in the area a hundred years ago. With ear splitting, heart racing airboat rides across the everglades you will be placed in the heart of action. Choose from fast airboat tours, educational trips, or even day and night photo opportunities tours. It's pretty much up to you, you only have to ask. Of course with most of the airboats and Everglade operators focusing in on the same kind of thing....wildlife, you are going to think that whoever you go with will provide with the same eco tour. Well, i'll be honest with you that's kind of correct, but its the little things that make the difference...like waiting times. Captain Doug's has this down to a fine art and with multiple boats running, and tours going out every thirty minutes you will know that this airboat trip you will get to the heart of the action and quickly. You can even phone ahead and reserve an airboat if you wish. This company certainly know how to get a good review or two as you can see here on a Tripadvisor page dedicated to them. With plenty of experience to gain the greatest views of the wonderful Everglades wildlife, then they could be just the company for you. Offering private, night time, or day charters, whatever your requirements for a trip into Florida's Everglades swampland you'll get it. You may think that with a name like Gator park, you will be focusing on the largest of the reptiles to be found in the wild. But this everglades company are so much more than that. Running boat trips every 20 minutes across the waters at breakneck speed, you do indeed see a few of these mighty creatures, but with tours, wildlife shows, and of course air boats, you will be spoilt for choice in what to do first. When it comes to air boat eco tours, we have tried to focus on the ones as close to the Florida Keys as possible. However if you end up near Orlando then Wild Florida Airboats could well be worth checking out. They offer day tours, sunset tours and even night eco tours that guests of all ages will love, where you will get up close and personal with bird, eagles, gators and a myriad of other Florida wildlife. Rides at Boggy Creek are the closest you will get to Disney and the major themes parks as you can. Based in Kissimmee these guys pretty much specialise on taking you out on the waters to see the local wildlife. If you are lucky you might even get to see the classic icon of all America the Bald Eagle, which hangs around the area. You most definitively will see gators and lots of them though. When you climb on to one of the airboats run by Spirit of the swamp, you will not have anyone next to you (except your family). They like to keep things as personal as possible in the swamp don't cha know! So enjoy Orlando's highest rated swamp eco tours, and sit back on brand new top of the range boats and let your guides fly you across in search of the best of Florida's wildlife.